Steve Patterson, chief operating officer of Sun Devil Athletics and managing director of the Sun Devil Sports Group, has been appointed ASU's vice president for university athletics and athletics director, subject to the approval of the Arizona Board of Regents. He will consolidate his duties as managing director of the Sun Devil Sports Group into his new responsibilities. Patterson replaces Lisa Love, who became vice president for university athletics in April 2005. She is leaving ASU to pursue other career opportunities. 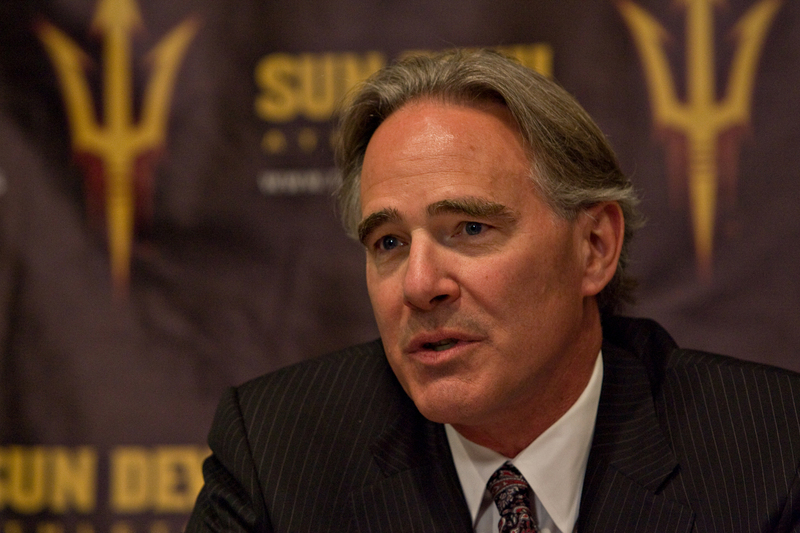 “In his time at ASU, Steve Patterson has shown a level of sports management expertise rarely seen at the college and university level,” said ASU President Michael M. Crow. “He is the ideal person to build on the foundation Lisa built and to take Sun Devil sports to the next level – to the highest level. Crow said the objectives of Sun Devil Athletics under the leadership of Steve Patterson remain the same: graduate student athletes, win championships and play by the rules. Patterson will review all current operations. He will evaluate how best to support Coach Todd Graham’s program to have a nationally ranked football team that wins Pac-12 championships year after year and the readiness of the men’s basketball team to return to NCAA tournament form. ASU athletics on March 1, 2012 received a full 10-year recertification by the NCAA Division I Committee of Athletics Certification, after a comprehensive overview of how its athletics program is operated. The program features 12 women's and nine men's sports and provides support to approximately 500 student-athletes. In the last seven years, ASU has won 15 conference championships and seven national championships (two in softball, one in women's golf, one in men's track and field, and three in women's track and field). In addition ASU student athletes have won 89 individual conference championships and 30 individual national championships. In 2008, Sports Illustrated named Sun Devil Athletics as the top athletic program in the nation, and that year ASU finished fourth in the Director’s Cup ranking – the high-water mark for the program. A 2009 Pac 10 Compliance Review report stated: “In some ways, ASU could be the poster child” for the NCAA Academic Performance Program. This program is dedicated to providing student-athletes with exemplary educational and intercollegiate-athletic experiences in an environment that recognizes and supports the primacy of the academic mission of its member institutions. In the number of its Academic All-Americans, ASU ranks third all-time in the Pac-10 (now Pac-12) Conference and ranks 19th all-time in Division I Athletics. Since the year 2000, ASU has had 53 Academic All-Americans, which ranks it second in the Pac-10 and ninth nationally. According to statistics released by the NCAA, ASU had an all-time high 79-percent Graduation Success Rate (GSR) in 2010-2011. The 79-percent GSR ranks ASU fifth in the Pac-12 Conference, just one percentage point out of fourth-place Oregon and just four percentage points from second-place (UCLA and Washington which tied at 83 percent). ASU's women athletes’ GSR rate is 94 percent, which is second in the Pac-12 only to Stanford (97 percent). The ASU men's GSR is 66 percent. Patterson will continue to manage ASU’s athletic facilities, the business office, marketing and fundraising operations. He will play a major role in ASU’s plans to renovate and enhance its major athletic facilities, including Sun Devil Stadium, with the revenue from its new athletic facilities district. Through legislative authorization from the State of Arizona, ASU has been able to form an athletic facilities district involving some 300 acres of land on its Tempe campus. As the land is developed commercially, the university can use the revenue stream from ground leases and payments in lieu of property taxes to fund the renovation and enhancement of its existing sports facilities and to build new ones. ASU expects to realize $15 million annually in new TV revenue from the Pac-12 television operations and is leveraging a portion of that income by reinvesting it in sports marketing and operations with the goal of doubling the budget of its athletics department in four to five years. Steve Patterson has built championship professional teams and designed, financed, built and run stadiums and arenas. As general manager of the Houston Rockets, he built the 1994 NBA Championship team. Later, he successfully led the effort to bring the Houston Texans NFL team and Super Bowl XXXVIII to Houston, Texas. As president of the Portland Trail Blazers, The Rose Garden and Rose City Radio, Patterson refined his skills as a turnaround specialist, while garnering national recognition for his player acquisition skills when he took over as the team’s general manager. Patterson also served as the president, general manager and governor of the Houston Aeros hockey team. For his efforts he was named the 1995 winner of the Andy Mulligan Trophy as the IHL’s Executive of the Year. In addition to his roles with the Aeros, Patterson also acquired and served as president and partner in Arena Operating Company, which managed and operated Compaq Center, Houston’s home of the Rockets, Aeros and Comets. Born and raised in Beaver Dam, Wis., Patterson attended the University of Texas, graduating with honors earning a bachelor’s degree in business administration in 1980. He graduated from UT’s law school in 1984. Faculty, staff, students and visitors to ASU's Tempe campus: Look around as you stroll the malls and notice the trees. Faculty, staff, students and visitors to Arizona State University’s Tempe campus: Look around as you stroll the malls and notice the trees. Trees in varying shapes, sizes, colors and textures. According to Deborah Thirkhill, program coordinator for the Arboretum, the five annual standards are the establishment of a tree-advisory committee, evidence of a campus tree-care plan, dedicated annual expenditures for its campus tree program, an Arbor Day observance and the sponsorship of student service-learning projects. “We won 100 trees the inaugural year of Tree Campus USA in 2008 and have received the recognition from the Arbor Day Foundation every year since,” Thirkhill said. 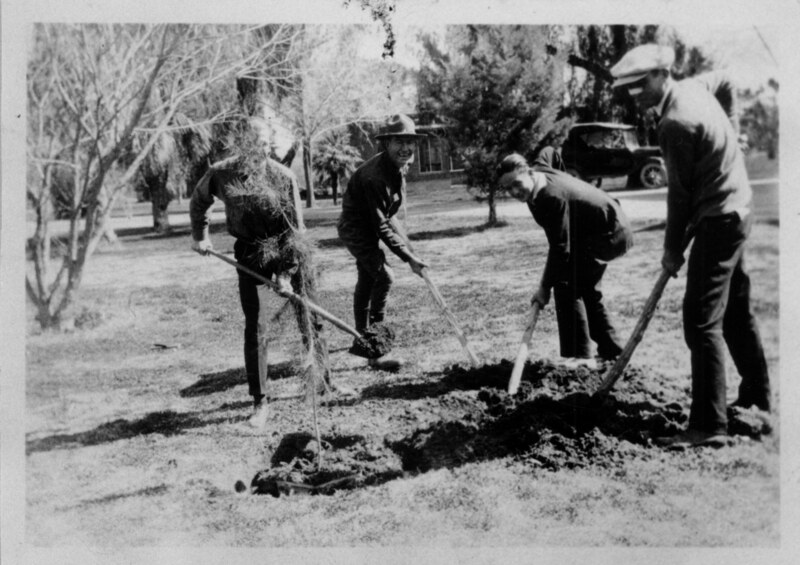 While the newest trees will be guavas, the oldest documented tree on the Tempe campus is the Arizona cypress on Orange Street in front of Physical Education East, which was planted in 1910,” Thirkhill said. There is no official count of the number of trees on the Tempe campus, but Thirkhill hopes to have a list soon. One of the annual standards set forth by the Arbor Day Foundation is having a tree-advisory committee. Two new members have joined ASU’s advisory committee recently – Chris Martin, a professor in the Department of Applied Science and Mathematics, who earned his doctoral degree in environmental horticulture from the University of Florida, and Alix Rogstad, program manager for Urban and Community Forestry Programs with Arizona State Forestry. “One of my many hats is overseeing and managing the Tree City USA, Tree Campus USA, and Tree Line USA programs within Arizona,” Rogstad said. “ASU has demonstrated its commitment to campus forestry by hosting and facilitating a multitude of projects over the years, and it has bragging rights because it was one of the first nine recognized Tree Campus USA in the country. “This, in and of itself, is something of which ASU-alumni and staff should be proud. I have been asked to be on ASU’s Tree Advisory Board because of my role with Arizona State Forestry. Playing a role (however minor) in the program’s future at ASU is exciting and I am looking forward to seeing how the program continues to flourish. Other committee members are Fernando Reyna, Grounds Services; Les Landrum, curator and research scientist, School of Life Sciences; Eric Tank, ASU student; Pedro Chavarriaga and Bryon Sampson, Office of the University Architect; Francis Eiland, Arboretum volunteer; Holly Hovious and Mike Bishop, Grounds Services arborists; Mike Schantel, Grounds Services supervisor arborist; and Alana Levine, ASU recycling manager. Tree Campus USA is sponsored by the Arbor Day Foundation and Toyota.